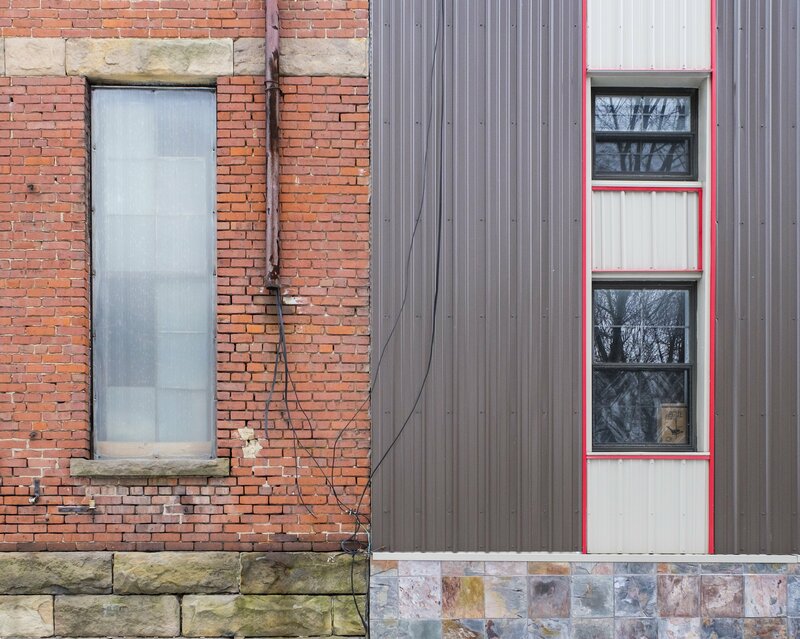 It’s often easy for a small building, even if its design is exceptional, to go unnoticed. This is particularly the case if it’s hidden in the middle of a residential neighborhood. This month’s structure is pretty large; an old factory, to be exact. But its unique location — off the beaten path, on a forgotten, dead-end street overlooking the valley north of downtown — has allowed it to keep a very low profile. The building was originally built around 1880 as the home of a silver-plating company. But a greater part of its life was spent as a factory for fishing equipment — first by the Pflueger Company and then its successor, Enterprise Manufacturing. Maybe we can settle somewhere in the middle and call it the Pflueger Factory. The structure was home to the Akron Silver Plating Company from its construction in the 1880s to that company’s collapse around 1898. An old directory listing notes the company was “a manufacturer of casket hardware and other silver-plated goods” and employed 45 people. Akron Silver Plating went into receivership in 1898. A group headed by Hugo and Max Schumacher invested about $50,000 to take over the business, but they could only keep it running for another five or six years. In 1905, the factory building was purchased by E.A. 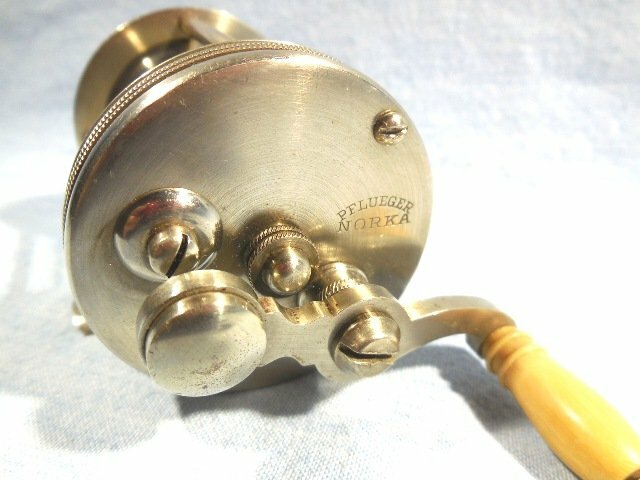 Pflueger for his fishing lure and tackle works. The Pflueger family had been in business since 1881, and already had a factory in downtown Akron on Ash Street. A rift between E.A and his brothers Charlie and Joseph led him to purchase the property on Bluff Street, while the original factory became the home of his brothers’ company, the Enterprise Manufacturing Company. Happily, the family split was healed by 1913; the company was consolidated under the Enterprise name and production subsequently divided between the two facilities. Eventually the Enterprise downtown building was destroyed by a fire. 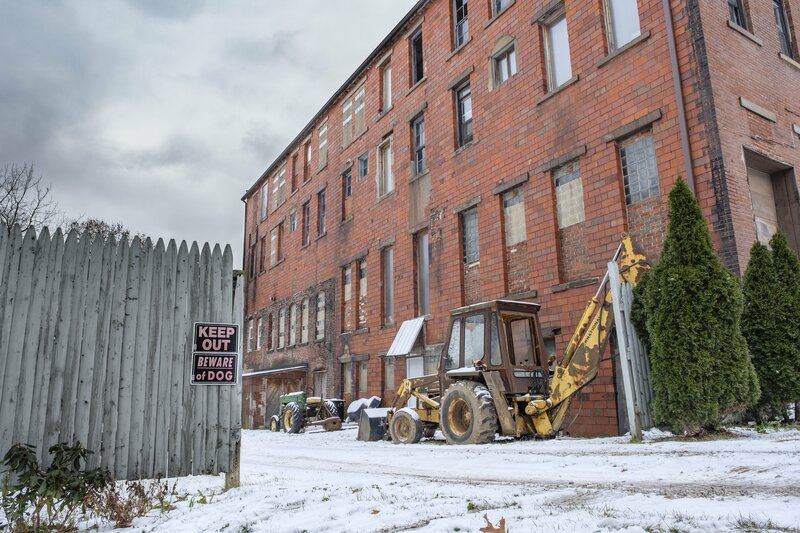 Sometime after World War II, Enterprise would move all its production into the former Werner Printing, a huge brick factory located nearby at the corner of North Union and Perkins streets. That factory was destroyed by another fire in 1977. As for the Pflueger factory on Bluff Street, it hosted two different mattress manufacturers from 1950 to the early 2000s. Looking at an old engraving of the Pflueger Factory building, it appears to have been much larger — which is entirely possible, based on cleared areas of the property and remnants of some old walls on the north side of the building. Then again, it was not uncommon for artists to exaggerate a little when depicting factories in advertising and on company letterhead. The bigger, the better! In truth, Pflueger/Enterprise was big. It was among the largest manufacturers of fishing equipment in the world, with its high-quality reels, advanced rods, fish hooks and photo-luminescent (read: glow-in-the-dark) lures distributed and sold almost everywhere. The company owned hundreds of patents and was celebrated as a world leader. The company’s vintage casting reels can still demand high prices on eBay. Sadly, the company was sold and relocated out of Akron years ago. Head up Bluff Street now and the lonely, ancient industrial building sits at the end of the road, kept company by some vacant lots and a handful of hundred-year-old houses. Some space in the three-story building is rented by small business and a non-profit agency. The structure looks solid and serious, with its handsome red brick exterior and cut stone found both in the foundation and in the bold Romanesque arches on the Bluff Street façade. Its castle-like tower still stands as a proud but lonely sentinel, reminding us of an important part of Akron’s pre-rubber industrial boom.